Search Item number 261287408885. reflects all this. Need accessories?. The twin handset wireless remote works beautifully. Wireless remote 50 ft range x2. Rated Line Pull. Braking Action. AND WE HAVE HAD IT SPECIALLY MADE IN GLOSS BLACK! Excellent winch, great value for money. 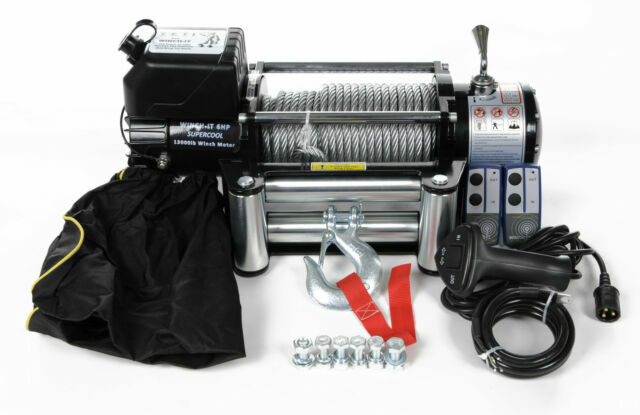 If you are looking for a low priced winch that performs well, then this is the one for you. Extremely easy to install but you will need to make some brackets for the fairlead. Both remotes came with batteries. Winch has been in daily use since it was fitted with no problems at all. Cracking winch if you're on a budget it's easy to install has great pulling power and an all round great package. Well worth the money! Best winch I've ever bought quality is brilliant will buy another one soon. Best winch I've bought really quiet top quality item.